After an exhilarating drive along the high cliffs on the Amalfi coast from Sorrento down to Positano, I found myself in sensory overload with its beauty and photogenic appeal. After circling around the entire village and its cliffside three times on Positano’s only street, which was a single lane winding down from the top and back up and over to where I began, I finally found the parking garage by the hotel, about 2/3rds up the facing village in this image. The climb down the winding road and steep staircases made for quite a workout in the hot late May sun. Reaching the beach and marina, I forgot about my exhaustion and could not capture enough of Positano’s plush beauty; however, the large amount of tourists and bright sun did not allow for ideal conditions. Walking the length of the beach, I found a very, very steep staircase leading straight up to a large veranda at the Albergo California. 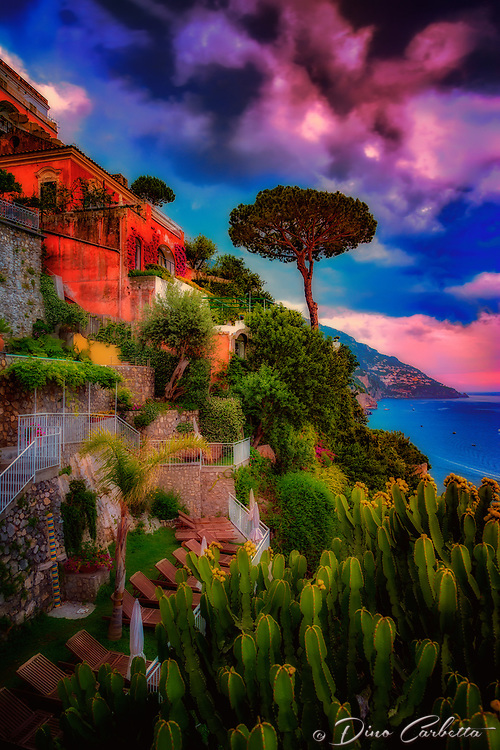 Taking an exhaustive seat on a plush lounge chair with a perfect view to watch the sunset behind the Amalfi Cliffs, I was taken back by a pleasant Italian (Positano) waiter from the hotel offering a towel, ice water, and drinks for the evening. I expressed that I was not staying at the hotel, but he didn’t seem to mind and proceeded to educate me on the culture of this historic resort village. After a brief rest, I wandered around taking full advantage of Albergo California’s 180 degrees of seaside vistas. Turning southward looking down the Amalfi Coast, the seaside town of Praiano began to appear ominous as storm clouds formed above creating a dramatic view.